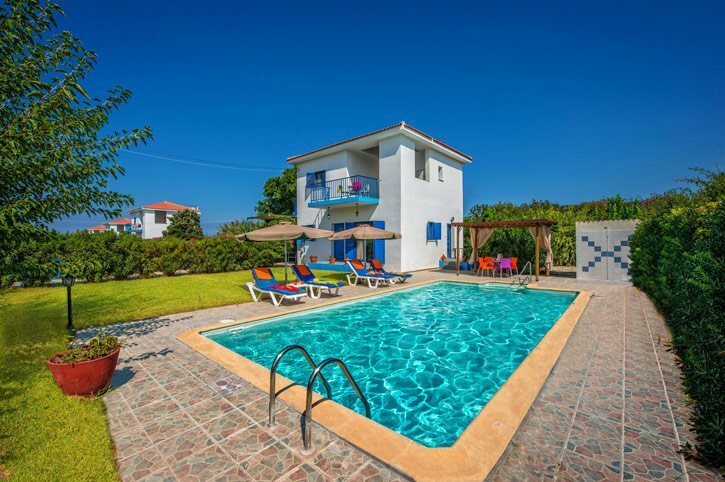 Villa Chara is a pleasant 2 bedroom, 3 bathroom villa located a stone's throw from the pebbly Rotiana Beach with the main beach at Polis less than half a mile away. A good choice of cafes, bars, shops and restaurants are just a short drive from the villa in the charming town of Polis and the beautiful harbour at Latchi is also close by. Air conditioning/heating in the bedrooms and WiFi are included. With Rotiana Beach on your doorstep and the charming town of Polis just short drive away, you have the best of both worlds! The private pool is surrounded by a paved terrace with a grass area to one side and a hedged border, which creates a sense of privacy. Next to the outside shaded dining area there is a BBQ - a great place for everyone to enjoy alfresco dining. From the gated driveway, a small porch and a few steps lead to the entrance, at the side of the villa. The entrance opens up into a bright and airy open plan living area. The lounge and adjoining seating area leads to a small exterior terrace where the pool table and table tennis table are located. The kitchen/dining area is equipped kitchen with all modern appliances as well as a table and chairs - perfect for breakfast. A door from the kitchen opens onto to the rear side of the property where the BBQ is located. All of the sleeping accomodation is on the first floor. There is 1 twin and 1 double bedroom each with a private balcony as well as separate shower room and bathroom. From the first floor, there is also access to a large partially covered balcony and seating area with distant sea and mountain views. This is the perfect spot for enjoying a cool drink and a book. On the ground floor there is also a shower room, a few steps down from the lounge. Villa Chara is ideally located just on the outskirts of Polis, in Chrysochous, a few minutes' walk from pebbly Rotiana Beach. A short drive takes you to the centre of Polis where you will find an array of cafes, restaurants and a few shops. The charming resort of Latchi, with its beach and harbour, is also a short drive away. Situated next to sister villas Kleoniki and Alexandra, Villa Chara is ideal for friends and family who wish to holiday together and yet retain their own privacy. There is a good choice of shops and a small market in the centre of Polis, which sells mainly fruits. From time to time there are pop up markets which are well advertised. There is a farmer's market in the old town of Paphos, where, especially at the weekends, you will see the locals out and about buying fruits and vegetables. If you are after some retail therapy the building of the Kings Avenue Mall in Paphos has many shops in one place. Polis is approximately 34 miles from Paphos on the North West Coast. The Polis Square and its surrounding area has a number of bars and restaurants but the ambience itself still remains laid back, calm and relaxed. If you are a seafood fan, then Latchi harbour is the place to be! Here you can find many seafood restaurants selling the fresh daily catch. The villa is on the doorstep of pebble Rotiana Beach, which is not developed but has beautiful views of the coastline. The nearest beach, which has sunbeds and parasols to hire, is Polis Beach, located just past the campsite and only a 15 minute walk away from the villa. Latchi Beach is just a short drive away. The horse riding facilities in Lysos are great for a family day out and are just a short car ride away. Also there is Go Karting on the outskirts of Polis. Paphos Bird and Wildlife Park and horse riding stables are all a short journey west which makes a great day out. Paphos Old Town, with its maze of small streets, is ideal for a truly unique Cypriot experience. Cyprus is teeming with loads of interesting historical places. In fact, the whole of Paphos is a World Heritage site. With the Tomb of the Kings, the Catacombs, the Saranta Kolones the castle, the village in Lemba being just a few of the places you can visit. Alternatively, you can visit Paphos Old Town, with its maze of small streets or head for Kato Paphos and the harbour, home to some of the most intricate mosaics in the Eastern Mediterranean. You will not run out of things to see and do! There are several golf courses in the Paphos area with Mario's Golf being the closest, which has a driving range, crazy golf and even foot golf. Alternatively, if you're looking for a 'real' round of golf, Tsada golf club would be another choice. There are loads of great and fun things to do. The Akamas Peninsular is a short journey west, by far the most beautiful location on Cyprus where you will find untouched landscape, amazing natural beauty, deep gorges and stunning sandy bays. In the opposite direction is the resort of Paphos. Why not go to Paphos Harbour and have a go on the Nautilus, the 7D cinema, or how about hiring a boat from Latchi Marina and sail to the Blue Lagoon in the Akamas National Park! Villa Chara is not available to book for season as it is sold out. Take a look here at the Cyprus villas that are currently on sale.